↑ Scotsman.com News. The Scotsman. Retrieved on 6 July 2011. ↑ «Broadcast rulings 6 April 05.doc» Archived 2011-08-11 at the Wayback Machine. ↑ Frog drives viewers crazy | The Sun|HomePage|News. The Sun (20 May 2005). Retrieved on 6 July 2011. 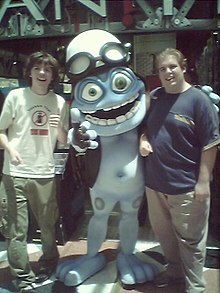 ↑ ASA stamps on Crazy Frog TV ads | The Register Archived 2005-10-01 at the Wayback Machine. BBC article: The Crazy Frog sound? That’s my fault. в том числе интервью с создателем звука, Daniel Malmedahl. The Times: Crazy Frog turns into a real prince. ASA: A Frog’s Tale that spawned viewer outrage.